Volunteers have been a huge part of Imago’s history! Our volunteers make it possible for us to do all of the great work that we do. Each year, volunteers give about 3,000 hours of time and energy to our causes. You too can support Imago by becoming a volunteer. There are 5 ways to volunteer. Imago Amigos – Participate in a scheduled volunteer event. Most of these take place on the second Saturday of the “school” months (September – June) from 9:00 – 12:00. It’s always a good idea to check to make sure that an Imago Amigos is taking place. Most Amigos work is on our preserve and entails gardening, trail work, landscaping and habitat restoration. As an Amigo you can come once, or you can come month after month, whichever fits your schedule. Music in the Woods – Volunteers make Imago’s late summer celebration a truly special event! Music in the Woods is the third Saturday in September. Look for MITW volunteer opportunities to start becoming available in early August. There are volunteer opportunities for before and during MITW. Volunteer Groups – Businesses, organizations, and other community groups can volunteer as a group. These group days are similar to a typical Imago Amigo, but with just your group. This is a great way to build camaraderie and teamwork in your group, while giving to a great organization (us!). We can design a volunteer event that can easily fit your group’s schedule and needs. Program Volunteer – This is a great way to give deeply to one of our programs. Our program volunteer commit to participate in volunteering over a period of time and help us plan and deliver great experiences. 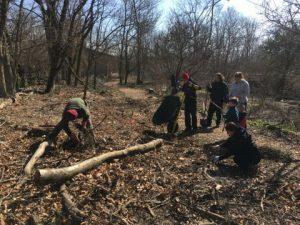 Our program volunteers can work with us on education programs, habitat restoration, land and trail management, gardening and other awesome projects. Service Projects – These are perfect for volunteers that are interested in working on one project, especially as a service requirement (such as an Eagle Scout project). If you are interested in service projects, contact us and we can give you a menu of possible projects and help you pick the one that works best for you! Give us a little bit more info about yourself so that we can ask you the right questions. Are you interested in volunteering as a group, or just yourself? Can be a guess, we can confirm later. Tell us a little bit about volunteer interest. Generally speaking, what days and times are you interested in, if you have a preference. What skills would you like to share, or skills that you'd like to learn through volunteering. Tell us a little bit about your requirements or interest. What days and times are you generally available for? Do you need to volunteer in order to complete service hours? Who is your service requirement for? Feel free to share any other information or comments that we should know. Thanks!